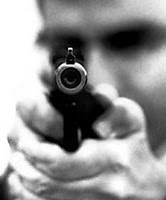 Before we dive into it however, I thought I'd just quickly mention again that this week I republished, here on Crime Watch, a great article by Philip Matthews of The Press on the recent growth of Kiwi crime fiction. Philip and Fairfax Magazines were kind enough to let me republish the full 2000-wd article here - and it's the only place you can read it on the Internet. So if you haven't already, please go here and read it, and leave a comment so Philip gets some feedback about the article. It was the 120th anniversary of the birth of Dame Agatha Christie on Wednesday (15 September), an occasion marked in many different ways all around the world (understandable really, since she is the biggest-selling novelist of all time, with more than a billion books in print - AND THEN THERE WERE NONE, originally entitled TEN LITTLE NIGGERS, has reportedly sold more than 100 million copies by itself). The Guardian had a story on how Google, that ubiquitious company, marked the occasion with a special detective-themed graphic on the day. A decade after being told that writing a novel with a lesbian theme would be 'commercial suicide', Val McDermid talks to The Independent about a cultural shift and the recent progress of lesbian fiction. The Miami Herald takes a look at whether the next wave in the ongoing crime fiction tsunami might come from books set in Stalinist Russia. John Sullivan of the Winnipeg Free Press takes a look at the latest offering from cool Canadian crime writer Giles Blunt's 'John Cardinal' series, which is set in a fictional small Ontario city. The Houston Press pays tribute to Murder By The Book's David Thompson, who tragically passed away very suddenly this week, leaving a true void in the crime fiction world. What do you think of the round-up? Which articles do you find interesting? Did you do anything special to mark Agatha Christie's birthday? Which is your favourite Christie novel? Do you think we are now more accepting of lesbian themes and characters in 'mainstream' fiction? Have you read any Russian set mystery tales? Please share your thoughts. I'd love to read what you think. Craig - Fine round-up! Thank you, as always, for focusing on these articles. I'm afraid, though, that I can't answer your question about which is my favourite Christie novel. I love too many of them, and couldn't pick and choose that way... I do agree, though, that many, many themes, including the lesbian theme you mention, are far more accepted in today's crime fiction than they were. The article about the Russian set fiction was fascinating and there are a number of books on that list I might have to add to my TBR Mountain. I really enjoyed Val McDermid's latest, Trick of the Dark, which has many lesbian characters, and I didn't think anything of it, as to me they were strong, well developed, women characters. It was them as individuals and how they interacted with each other that was important. I loved the Google homage to Agatha Christie's birthday. Google NZ didn't have it did they? Or did I just not Google anything that day. Great round up, as always, thanks. Most interesting to me were the articles about Giles Blunt and the increasing interest in mysteries set in Russia. My favorite Christie: it would have to be _Nemesis_ with Miss Marple. I don't know about widespread acceptance, but I know of two good mystery series featuring lesbian detectives. Ingrid Blacks' "Saxon" series set in Dublin have a lesbian relationship between Saxon, a ex-FBI profiler, and a high-ranking police officer. In addition, there's Laurie R. King's "Kate Martinelli," a lesbian cop with LAPD, which I consider to be far more interesting than her Mr. and Ms. Sherlock Holmes series. Acceptance of lesbianism (and other "adult" content) in genre fiction remains a no-no for many overseas hardcover publishers. I've lived in New Zealand since 1967 and I've written westerns for Robert Hale Ltd (London) since 1992. My twenty-fourth, and seventh in the Misfit Lil series, was rejected by Hale on the grounds it would be unsuitable for public libraries because of this. Fortunately, I have a reader following and saw fit to go ahead and publish the book myself, using Lulu. Paradoxically, in view of John Hale's views, the book has since been picked up for large-print reissue by Ulverscroft whose contract says the book, "will be mainly used by Public Libraries, Hospital Libraries, Institutions for the Blind, Welfare Authorities, Homes for the Elderly, and Charitable Organisations." I'm also not having to split payment for the large-print edition 50/50 with Hale!